Vintage 1960 Photograph of Ferrari 246 Dino Sport S/N 0778 burnt out at the Nurburgring 1000 KM. 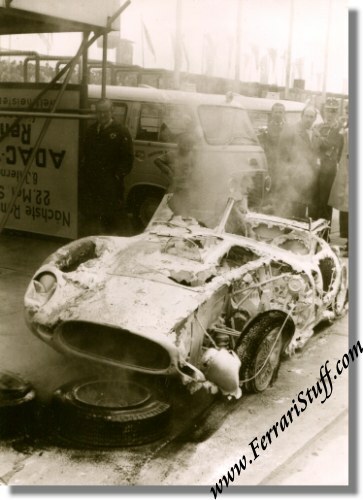 This photo was taken after the Dino 246 Sport of Giorgio Scarlatti and Giulio Cabianca caught fire during an early pitstop in the hunt for victory during the 1960 running of the Nurburgring 1000 KM on May 22, 1960 and shows the still smoldering wreckage of the car. After this incident, the factory-entered car went back to the factory and was scrapped after which Ferrari built a new car using this chassisnumber which survives to this day. The photo measures approximately 12.5 x 17.25 cm or some 5 x 7 inches. This is a vintage print, i.e. printed shortly after the original image was captured on film and carries no references to the possible photographer.